Consumer Price Index (CPI) is an index of the prices of consumer goods and services purchased by the consumers. It is used to measure the rate of inflation or the cost of living. CPI for Afghanistan is a weighted average of the CPIs for Kabul, Herat, Kandahar, Jalalabad, Mazar-e-Sharif and Khost. The weights used in the index for food and non-food items are 60.6% and 39.4%, respectively. Following decades of war and neglect, the reconstruction of the health system in Afghanistan is in full swing since 2002, thanks t- considerable efforts undertaken by the Ministry of Public Health (MoPH), donors, various experts, and national and international NGOs. The first priority was developing basic health services throughout the country, namely the Basic Package for Health Services (BPHS), and the second was the reorganisation of the hospital system. After decades of war and destruction Afghanistan entered a new era in December 2001: with the signing of the Petersberg Accord, the foundation for the political and economic reconstruction of the country had been laid. The NRVA 2005 was the second national exercise in data collection on risk and vulnerability factors that affect the Afghan population. 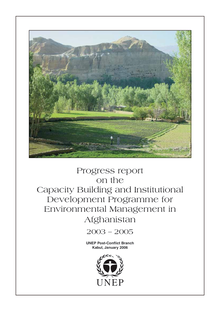 The main objective of NRVA 2005 was to gather information to update and guide policy-making decisions in development programmes and to improve the efficacy of sectoral interventions. "I am illiterate and I work as a local Daya (traditional birth attendant) in my village. One night people came and picked me up to deliver a baby in their home. The woman had very serious bleeding and I could not control it because I did not know how, so they brought a midwife. It was midnight and the case was very serious, but the delivery happened safely. Since I have received training from the Afghan Institute of Learning (AIL), I now understand many things. Follow-up to the Fourth World Conference on Women and to the special session of the General Assembly entitled "Women 2000: gender equality, development and peace for the twenty-first century"
Despite poor weather conditions and difficult terrain, Islamic Relief aid workers continue to work in 300 villages in four of the worst-affected districts of Kashmir. Around 260,000 earthquake survivors have benefited from IR's projects in shelter, food security, health, water, education and livelihood. IR has raised funds in excess of £10,600,000 for the Pakistan earthquake. In addition to this, organisations and individuals have donated several tonnes of aid goods worth millions of pounds to IR for distribution in Pakistan. On December 13, 2005, provincial officials and community members formally inaugurated Radio Jaihoon,the first independent radio station in Imam Sahib, the capital of Kunduz Province. The Deputy Governor of Kunduz, the Mayor of Imam Sahib, the Head of the Information and Culture Department of Kunduz, and several local elders and students attended the inauguration. KABUL, 27 Dec 2005 (IRIN) - A roadside bomb on Monday injured two soldiers serving with the International Security Assistance Force (ISAF) and two civilians in northern Afghanistan, ISAF said in the capital Kabul. "At around 11:15 Monday, a two-vehicle ISAF convoy was involved in an explosion in Baghlan province," Maj Andrew Elmes, an ISAF spokesman said. "Four ISAF members were involved, of whom two have been injured and one of the two vehicles was heavily damaged," Elmes noted. Her situation was hopeless - and getting worse. Born into poverty in Afghanistan, one of the poorest countries in the world, Ramzia never had high expectations of life. But even the few dreams she might have had were shattered when disaster struck. Her father was killed in the country's civil war and, soon after, the district of Kabul she lived in was reduced to rubble by rocket attacks. Girls in Kandahar are being denied an education because of tradition and security concerns. KABUL, Dec 23, 2005 (Xinhua via COMTEX) - A primary school in the Afghan southern province of Kandahar was set on fire by suspect Taliban militants Thursday night, said an Afghan official on Friday. For the first time in 3 decades, Afghanistan has a popularly elected parliament. The last year that an elected national assembly functioned was 1973, before coups and a Soviet invasion brought 30 years of conflict and despair to the country. Elections took place in September, but the parliament was officially sworn in and convened on December 19 2005, marking the conclusion of the political transition process agreed on by Afghan factions in December 2001. The recent spate of suicide bombings has put much of Afghanistan on edge.